A review written from beneath a duvet with every light in the house blazing. I GOT to know a complete stranger very well during the second act of The Woman In Black at the Fortune Theatre, Covent Garden. No, we didn’t pass the time chatting while people in the surrounding rows ‘shushed’ us in impatient tones before reporting us to the usher and having us thrown out. We did, though, almost leap into each other’s arms on more than one occasion and smiled sheepishly at one another when the play finished. And all this with Keith sitting on one side and her daughter sitting on the other. The Woman In Black is the most ridiculously scary play I have ever seen. More scary than Alison Hannigan’s performance in When Harry Met Sally. More terrifying than William Shatner’s solo readings of Henry IV, V and VI (with props), and more frightening than those musical episodes of DS9 that proved once and for all that Paramount had lost the plot. 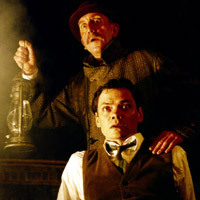 There are only two names on the cast list - Michael Burrell as Arthur Kipps and Dominic Marsh as The Actor - and both are outstanding, especially Burrell, whose range of characters during the performance was huge. There is a third member of the cast, though her name doesn’t appear in the programme and she doesn’t take a bow at the end. And that’s part of what makes the play so gripping. It is actually set in the Fortune Theatre and the actors play to one another and an imaginary audience. Within the confines of the theatre, they imagine themselves to be in a London office, a northern village and a tiny island cut off from the main land except for a causeway, which makes itself known at low tide. The set is simple and dark, the props few and used for many and varied a purpose. And the use of light and sound is amazing. For those who haven’t read the book or seen the film, this is a ghost story with a particularly nasty ghost - whenever she is seen, a child dies. Solicitor Arthur Kipps is sent to close the estate of an elderly client who has recently died. She lived alone in a sprawling house on the island and only ever had two visitors - Keckwick, the local pony and trap man, and the Woman In Black. Arthur’s time at the house plays on our fears of the unknown and things half seen from the corner of the eye and is so much more effective than the blood and gore that makes up so many run-of-the-mill horrors. The audience was a mass of tense anticipation, the slightest pause in the dialogue bringing frightened whispers. And when the Woman did make herself known, either in fleeting glimpses or full howling fury, the poor souls at the front were all but trying to climb through their seats into the row behind. Not a show for those of a nervous disposition or weak bladder, but definitely worth a look. Hurry, though, the run ends in September, having been going since 1989. For those interested in seeing the play at the Fortune Theatre in London, cheapthreatretickets.com may be worth a visit.